My daughter found a basketful of Beanie Babies at a Hospice Thrift Store and picked them up for my Operation Christmas Child shoeboxes. They were just 25 cents each if she bought them all (a major find for us). One of them was a ghost. I didn't feel he was appropriate for a shoe box so I gave him a make over -- "Let It Snow!" I'll add other Snowman themed gifts, too. I also plan to crochet a scarf and hat to match his. I tucked in his "tail" and peak on his head to make him round and sewed the seam. Took off his red tongue and added the crocheted scarf and hat made just for him. 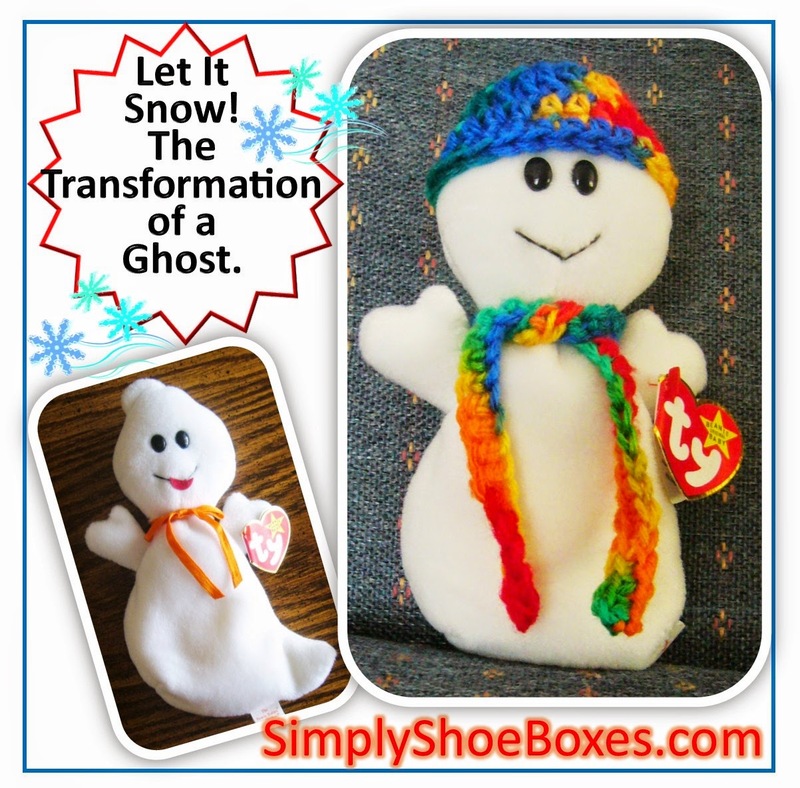 UPDATE: You can see the final shoebox here: How a Snowman Shoebox Came Together. You can see another doll makeover I did here: Beanie Baby Doll Makeover. So if you receive a donation of an item that you don't feel is appropriate to include in an Operation Christmas Child shoebox, see if there is a way to make it work by giving it a makeover. That is awesome I never thought about giving them makeovers. I just haven's used some. Thanks for sharing with us. Glad to give a little inspiration for making things work :-) . Hope you have some in the future you get to make over. You are so creative! This is a great idea. I'm hoping to send an extra box or two this year. Your tips are giving me ideas! So glad to hear the posts help you, Dede. I would be thrilled if you found it easier to pack more boxes because of what I share. Thanks for commenting.